By the time the 2018 Winter Olympic Games opened in PyeongChang last week, the masterminds behind the so-called Russian doping scandal had finally lost their control of the narrative, causing irreparable damage to the Olympic movement and to sports in general. The politically motivated actions of a tiny group of functionaries in the sports industry have discredited the very concept of the purity of athletics and have resulted in a sharp drop in the world’s interest in the Games in PyeongChang. This is evident in the disastrous attendance figures (a month before the competitions began only 60% of the tickets had been sold, and the most popular events, hockey and figure skating, had the highest number of unclaimed seats) and could also be seen in the significant drop in the IOC’s ad revenues. The reason for this downward spiral is obvious, when some athletes are discriminated against based on their nationality while others run mad with impunity, this not only ruins the element of suspense in the competitions, it also kills off spectator interest and advertising contracts. Back in December 2014, Germany’s ARD television channel produced a documentary featuring Russian track and field athlete Yuliya Stepanova and her husband, Vitaly Stepanov, a former employee of the Russian Anti-Doping Agency (RUSADA), in which they “exposed” the system of doping in Russia. The fact that one year previously Stepanova had been disqualified in Russia, losing her eligibility for two years for doping, and that her violations had only been revealed after her husband left RUSADA in 2011, had somehow escaped the attention of the documentary’s creator Hajo Seppelt (for more information on the first round of efforts to promote the doping scandal, see our July 2016 article, “The Olympics as a Tool of the New Cold War”). A month later WADA established a commission to investigate the alleged use of doping in Russian track and field athletics. 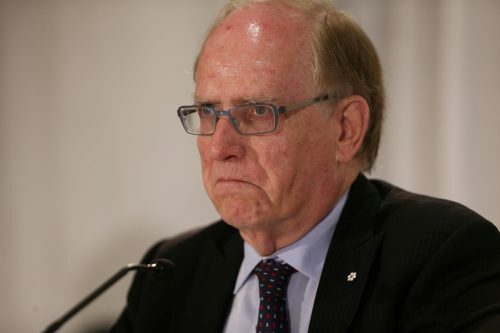 It consisted of three people: the chairman and first president of WADA, Richard Pound (Canada), a law professor from the University of Western Ontario, Richard McLaren (Canada), and a former criminal investigator at Interpol, Günter Younger (Germany). On November 9, 2015, this commission published a report that included accusations against RUSADA. The report also stated that in December 2014, the director of the Moscow Anti-Doping Laboratory, Grigory Rodchenkov, had ordered the destruction of more than 1,400 athlete doping tests, three days before a WADA audit team was to arrive in Russia. On November 10, 2015 Rodchenkov resigned from his position and in January 2016 he emigrated to the US (for more details on this individual’s background, please see the article mentioned above, “The Olympics as a Tool of the New Cold War”). On May 12, 2016 the New York Times published a media bomb based on information provided by Rodchenkov. It alleged that a special “doping program” was developed in Russia before the 2014 Winter Olympics in Sochi, involving several dozen athletes, and its “specialty” supposedly consisted of anabolic steroids that were washed down with alcohol (!). 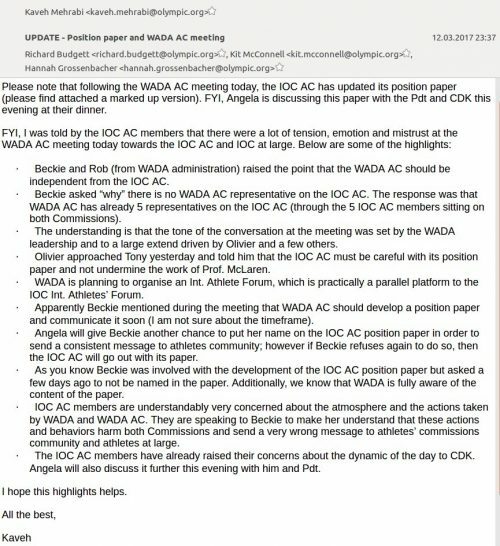 Then, in order to verify these borderline-bizarre allegations, WADA, at the IOC’s request, established yet another commission, this one headed by McLaren, which in July 2016, just a few weeks before the start of the Olympic Games in Rio, released the first (apparently urgent) section of its report that made the unsupported claim that the doping program in the world of Russian sports had the backing of the Ministry of Sports, the Sports Training Center for Russian Teams, and the Russian Federal Security Service. On the basis of this “document,” which was never subsequently deemed convincing by any judicial authority, practically all Russian track and field athletes, as well as several competitors from other events, were banned from the Games in Rio. In November 2016 a new legislation took effect in Russia making it a criminal offense, with a punishment ranging from a fine to 3-5 years imprisonment, to induce an athlete to use doping drugs. In 28 cases, the evidence collected was found to be insufficient to establish that an anti-doping rule violation was committed by the athletes concerned. Decisions about what to do with the remaining athletes were either postponed because it was no longer a pressing matter (the athlete in question had already retired) or else the plaintiffs’ appeals were partially upheld. The lifetime ban on participation in the Olympic Games was lifted from all the applicants. Despite the fact that the court blocked the IOC’s arbitrary decision to strip the Russian athletes of the medals they had won in Sochi, there was not time to challenge another egregious verdict: suspending the Russian Olympic Committee’s membership in the IOC and forcing the Russian team to compete in PyeongChang under a neutral Olympic flag. Before we try to get the lowdown on this story, we must emphasize once again: both of these “investigative commissions” were established in the immediate aftermath of the made-to-order and in many respects fake news reports in the Western media about “doping in Russia.” The biggest tipoff that they were fake was the fact that the main protagonists of this “investigative journalism” were individuals who had been justifiably punished or prosecuted in Russia for either using doping drugs or inducing others to use them, and under pressure from their media patron, those individuals extrapolated from their own sad experiences in front of the cameras to condemn the entire Russian sports community. The hack jobs by Hajo Seppelt and the New York Times on the subject of Russian doping are examples of fake news in its purest form. So, to all appearances, shortly after Russia’s triumphant performance at the Sochi Olympics, a small group of predominantly Anglo-Saxon sports functionaries made the decision (at present it’s hard to say whether they did so independently or at the behest of someone higher up) to ensure that there would be no more unpleasant surprises in the future. They hired several professionals, the most publicly visible of whom were Richard McLaren and Hajo Seppelt, to help out with the media on their project and lend it an air of expertise (proof that McLaren is in no way an “independent lawyer” can be seen in his outraged reaction to the February CAS decision). In addition to the challenging task of discrediting Russian athletics in the international media, these individuals had to conduct a backstage war with the International Olympic Committee at the same time. Far from everyone in the IOC’s leadership was delighted at the prospect of the nascent scandal and the serious damage to the Olympic movement that was being broadly predicted three years ago. This is quite evident from the copies of the email correspondence (seemingly quite genuine) between IOC officials in regard to the doping scandal that have recently appeared on the Internet. The establishment of acceptable evidence is a significant challenge, as some IFs have already experienced; where in some cases they have had to lift provisional suspensions or were not able – at least at this stage – to begin disciplinary procedures due to a lack of consistent evidence. 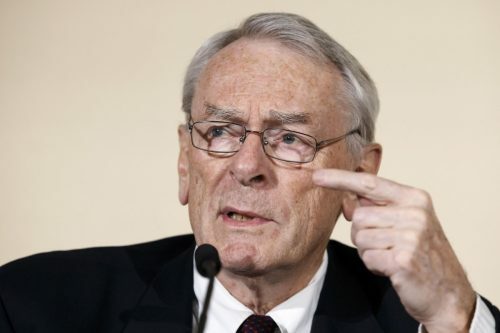 At the recent meeting (21 February) held by WADA in Lausanne to “provide assistance to IFs regarding how to analyse and interpret the evidence”, it was admitted by WADA that in many cases the evidence provided may not be sufficient to bring successful cases. IFs were told by WADA to make direct contact with the IP team to try to obtain further information. WADA also explained that the translations used by the IP team were not adequate and was obtaining official translations of some of the texts. It is already evident from the appeals filed against some International Federations provisional suspension decisions that the IOC decision will have to stand up to a strong legal challenge. The IOC is also pursuing the reform of the WADA system… We are driving forward to establish an independent testing authority – independent from sports organisations and from national interests… Sanctioning should be delegated to the CAS as the IOC successfully did at the Olympic Games Rio 2016… The IOC has made proposals for more accountability, transparency and diversity [of WADA]. The Belgian lawyer and IOC Director General Christophe De Kapper was one of the few officers inside the Committee who tried to follow the rule of law during the “doping scandal”. You are unlikely to have read Prof. McLaren’s March 2, 2017 response to this memo. But it’s quite interesting and a few passages from it deserve to be quoted here. It would have been helpful if you had spoken to me in advance so that I could have addressed the various issues you raise in relation to my Report. It was not my mandate to bring violations against individual athletes. I am concerned that the IOC seems to be on a quest to re-define my mandate by attempting to establish that my Reports are inadequate for a purpose for which they were never intended. In regard to the confusion about the terminology (“state sponsored system”), McLaren acknowledges that the fantasies of those who fabricated information for him about “Russian doping programs” did not rise higher than the ministerial level (“My evidence stopped at the Ministry of Sport”). The translations into English by my team… were never intended to be ‘official’. They were provided on the Evidence Disclosure Package (EDP) to assist users and not to certify the translation for some legal purpose. It should be pointed out that the IOC as well as (and maybe even more so) the IFs are being asked to take some very tough decisions, with serious legal and non-legal consequences, on the basis of the Report(s). It seems that Robert (sic) McLaren’s first Report was intended to lead to the complete expulsion of the Russian team from the Rio Games, and the second – to expulse the Russian team from Pyeongchang Games, but not to deal with athletes on an individual basis. Perhaps McLaren and WADA should have thought this through in more detail prior to the Reports being made public – in particular, to themselves to have had the courtesy to discuss this matter of principle with the IOC in further detail, before WADA went down the path of using the (first) Report to try to have the Russian team excluded from the Rio Games, rather than McLaren and WADA considering to go down the path that the IOC intended to take, namely, to deal with the individual athletes on a case-by-case basis. This put the IOC and the IFs, and the Olympic movement in general, in a very difficult position. As a senior and respected international lawyer, you will certainly appreciate that the process of gathering credible evidence against individuals, sufficiently robust to ensure convictions in a manner which justice is done and seen to be done, is a long and detailed process. It was for this reason that it was felt necessary and important to send a communication to the Olympic Movement on the work by the two IOC Commissions to explain the process and describe the work that was being done. Indeed, it was the very fact that your mandate did not extend to individual cases that impelled us to explain to our stakeholders the process that is underway to complete this work. This may well be the case – but as a law professor I hope you will agree that this is another instance where the standard of evidence we will need to successfully prosecute cases is higher than the evidence you have provided. As for the matter of you changing your description of the affair from a ‘State sponsored’ system to an “institutional conspiracy” this does seem to mark a change in attitude on your part. However, whatever your final conclusions, whilst your report does indeed uncover a conspiracy there is precious little evidence as to who would be involved in such a conspiracy. Would this again be a case that ‘goes beyond your mandate” or would you be able to indicate and provide evidence of who exactly may have been involved in this conspiracy. At present you have left us with good evidence that a crime has been committed but little evidence of those who were responsible. Let us both agree that cooperation has not always been what it should have been between the IP team [Independent Person – a sleek euphemism, used by Prof. McLaren to indicate himself in his reports – OR] and the Olympic Movement. You have brought to our attention the limits of your mandate. However, please note that, in view of these limits, the IOC and, in particular, the IFs have ended up bearing a huge and very difficult burden in trying to convert the material/information referred to in your Report into Anti-Doping Rule Violations against individual athletes. A further problem was created by your Report (and the previous Report regarding this subject) seemingly being used to try and justify a total ban of the complete Russian Olympic team from the Rio Games and the Pyeongchang Games when, in fact, the IOC and the IFs are/were simply not of the view that a collective punishment should be, or should have been, imposed upon all Russian athletes [all emphasizes done by OR]. 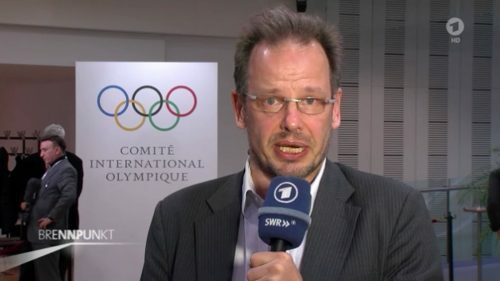 It is clear that such cooperation [between the IOC and IP team – OR] is now needed if we are to do our job and to turn your general conclusions about an ‘institutional conspiracy’ into concrete findings against individuals and organizations and also if we are to successfully prosecute individual cases with at least a chance of success at CAS. WADA has said that International Federations need to contact your team directly to receive materials. It would be good to receive your cast iron agreement that your team will offer this full cooperation and allow us to go beyond your mandate and prosecute successful cases against individuals and organizations based on evidence that will stand up in a court of law. 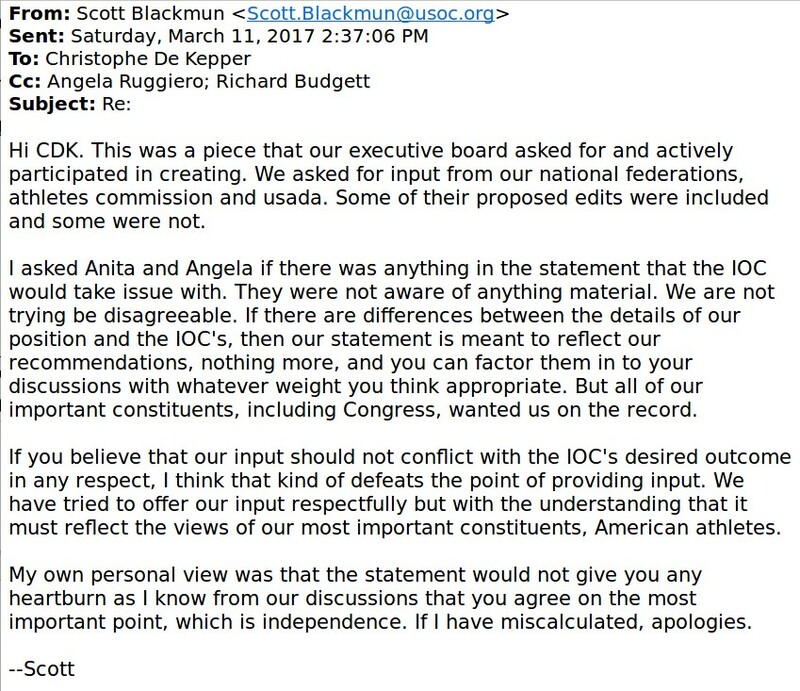 It is interesting that during those same few days when de Kepper was working with his staff to draft the letter answering McLaren, de Kepper was also corresponding with the chief executive officer of the US Olympic Committee, Scott Blackmun. 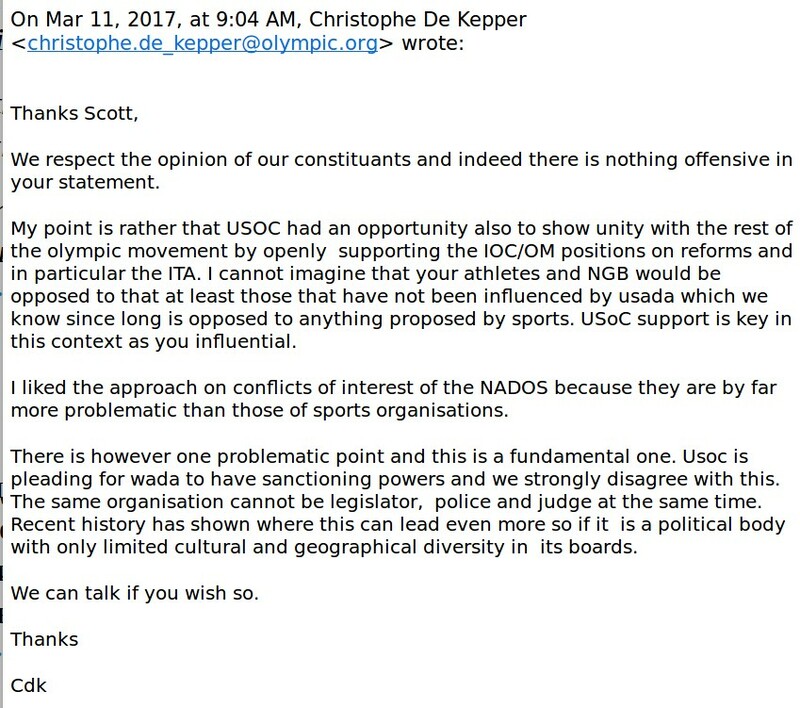 My point is rather that USOC had an opportunity also to show unity with the rest of the Olympic movement by openly supporting the IOC/OM positions on reforms and in particular the ITA [Independent Testing Authority – OR]. There is however one problematic point and this is a fundamental one. USOC is pleading for WADA to have sanctioning powers and we strongly disagree with this. The same organisation cannot be legislator, police and judge at the same time. Recent history has shown where this can lead even more so if it is a political body with only limited cultural and geographical diversity in its boards. Perhaps sports-industry insiders will be able to glean other interesting nuggets from this document. Here is the picture that is emerging based on the material available to us: There is indeed a conspiracy at the heart of the “Russian doping” scandal, but it’s quite a different one than what the global media has so fervidly described so far. This conspiracy involves WADA bureaucrats and a few national Olympic committees (the USOC is among them for certain), and their goal is to establish complete control over the system of regulating doping in sports, independent of the IOC. They need that control, on one hand, to prevent any PR damage from the systematic use of doping by Western athletes, and on the other – to acquire some effective leverage in the form of political and propaganda pressure that can be used on any sport nation they think needs to be hog-tied. 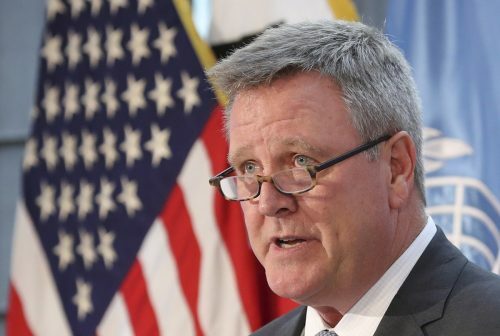 Even more condemning conclusions over the doping deadlock the WADA is leading the international top sport into, were articulated by the late honorary member of the IOC Hein Verbruggen in his letter to Thomas Bach on October 13, 2016. If you haven’t read it yet, we strongly recommend to do it now. The dramatic events of the last months in anti-doping have made us all think about WADA’s role and responsibilities. I think we have suddenly all realized that this organisation has in fact during 17 years been in the hands of four people: Mr Pound, Mr Howman, Mr Reedie and Mr Niggli. I left out Mr Fahey who unexpectedly was put into the WADA chair without having any experience in anti-doping (which was perhaps convenient for those who wanted to retain the power but definitely not good for WADA). With all respect for President Reedie, I think nobody familiar with WADA will contest that Mr Pound still has a dominant position within that organization. 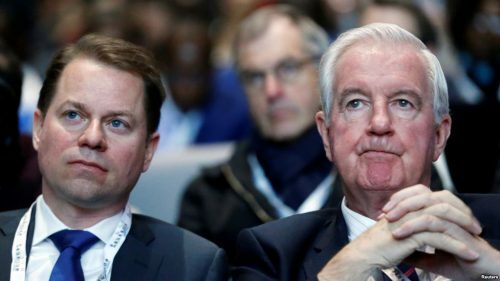 We have to face up to the inconvenient fact that many within the Olympic Movement are afraid of criticism by WADA and Mr Pound in the sensitive and mediatic field of anti-doping. This fear explains in my view why Mr Pound and friends do not seem to worry about not being nominated anymore and why they have been able to maintain their WADA positions for 17 years, as if there were no other competent people and good governance would not recommend a change from time to time. But of course Mr Pound sees that fear also and it explains why he feels so strong in his lecturing (and in my opinion: even insulting, see e.g. his “redemption” article) the IOC. Even recognizing the work that WADA and its leadership have done for the fight against doping, that does not allow to turn a blind eye on what went wrong. This has recently culminated in WADA arrogating a public call on the IOC to impose a last minute ban on all Russian athletes from the 2016 Olympic Games, whereas it was precisely WADA that largely contributed to this very problematic situation by not following up promptly and adequately the information it had received since 2010. My battle was, and still is, also for what I consider to be WADA’s genuine mission in an effective fight to protect clean sport, and in support of the IOC that has the moral leadership of the fight against doping and was and still is repeatedly chafed by the WADA leadership. 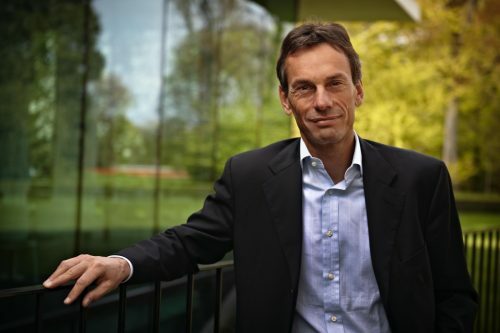 As we know, despite the desperate struggle for legitimacy in sports, at least by the Director General of the IOC Christophe de Kepper, the International Olympic Committee was eventually forced to yield to the pressure of the international doping lobby. The question as to what types of leverage were being used in mid and late 2017 might be the topic of a separate investigation. It is obvious, for example, that McDonalds’ June 2017 decision to terminate its sponsorship contact with the IOC ahead of schedule, after a 40-year partnership, did not happen in a vacuum, but was instead part of a campaign to exert pressure on the IOC leadership. This article was posted on Saturday, February 17th, 2018 at 11:05am and is filed under Athletes, Fake News, Korea, Media, Olympics, Russia, United States, US Hypocrisy.